Hi - I am using your "Thank you" page, but I added my own link to it. "get more gift ideas". To get more gift ideas, I want them to go back and fill in the form again. They will then start on page 2, not page 1 of the form. 1) Will Jotform store the form as a new form if the user clicks on the link and it skips page 1 and takes them directly to page 2 of the form? or will it pick up the user's email address from page 1 of the form. 2) The formatting came out really weird after I hit "get more gift ideas". Can you tell me what I might be doing wrong? I included a screenshot of this embedded screen. 2. I can't seem to replicate the problem. Is this already resolved? If not, please give us more details on how to replcate the said problem. Hi - Thank you for your help thus far! Regarding Question #2, I have not resolved it. What happened was that I created my own "Thank you page" with a link to my FORM 1. 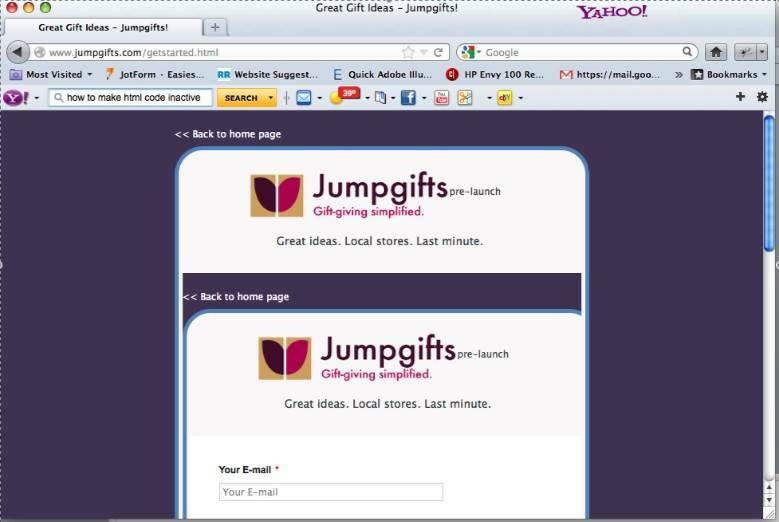 This is the Thank you page - located after you completely fill in http://www.jumpgifts.com/getstarted.html. After someone clicks on the Thank You page link that says "Get more gift ideas", I want them to be able to go to my form and fill it in again. The problem is that when I Send them back to my form, I get the weird embedded page that I asked about in my question #2. I have identified the problem. Thanks for this details. We'll see if we can find a workaround for this. Please stay in touch. Thanks! Can you try changing the to on your Get more gift ideas source? Not quite sure if this helps but worth a try. Thanks! that works!!! You have been a huge help. Thank you! In behalf of our colleague, you are quite welcome!